Amsterdam New West is one of the area’s outside the city center of Amsterdam that is under massive development. Old flats are being taken down, and new houses are build. 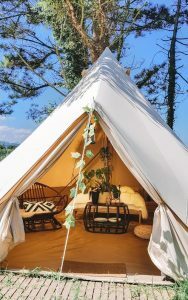 With the housing, come new hotspots and one of those is Hotel Buiten. The place to be this summer, if you live in Amsterdam West. 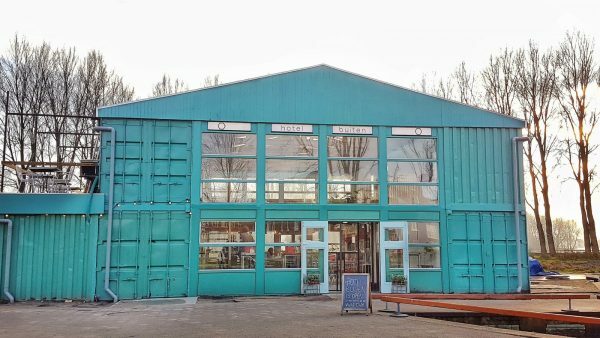 Hotel Buiten is not just any hotspot, it’s a creative hub, build from raw and used materials, designed by Lenka Dittrichova. It stared with a few neighbours a few years ago, that wanted to do something with lost space full of weeds and grass. 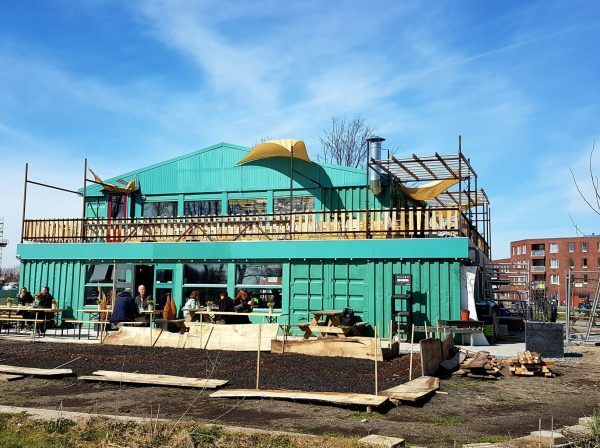 After a temporary set up, they managed to get more people involved and eventually 180 people and businesses helped fund the project. Many volunteers helped build the building, so you could say that Hotel Buiten is community. No, it’s not a hotel, but they do have future plans to rent out self-build houses around the Sloterplas area. 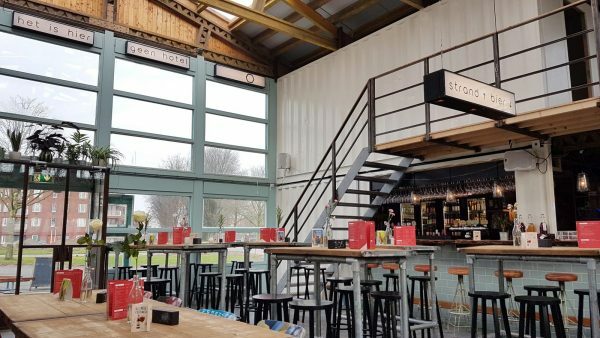 They started to build Hotel Buiten in the beginning of 2017, and even though they officially opened up their doors months ago, they’ve just recently added the finishing touches. Hotel buiten is located next to the Sloterplas and surrounded by water from all sides, which makes it an unique spot. 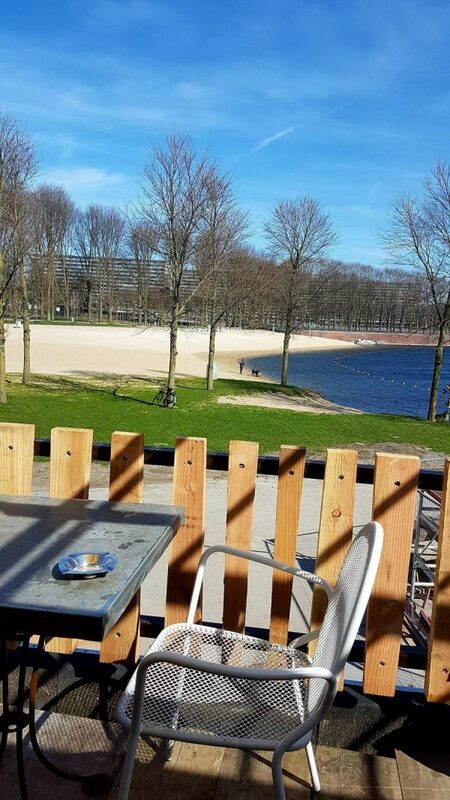 Sloterplas is gaining popularity because of the man-made beach, sailing activities and the recently opened Van Eesteren Paveljoen. At Hotel Buiten they cook seasonal. Meaning, that they’re changing the menu every few months of the year to guarantee the best flavours. Most products are organic, and with the home garden recently finished, they will use their own herbs for seasoning. For lunch you can order homemade soups, salads or sandwiches. Nice to know; the bread comes from iambe, a non-profit organisation where people with a disability help bake the bread. For coffee you’re also at the right address with beans from The White Coffee Label, and beer drinkers are happy to know that they have a variety of local craft beers available. I had a little peek this week because they’ve recently opened the upstairs and downstairs terrace, which gives you a nice spot in the sunshine. They are currently building an upstairs and outside bar, to accommodate customers during the high season. The location is also perfect for hosting a wedding or birthday party, with plenty of options. 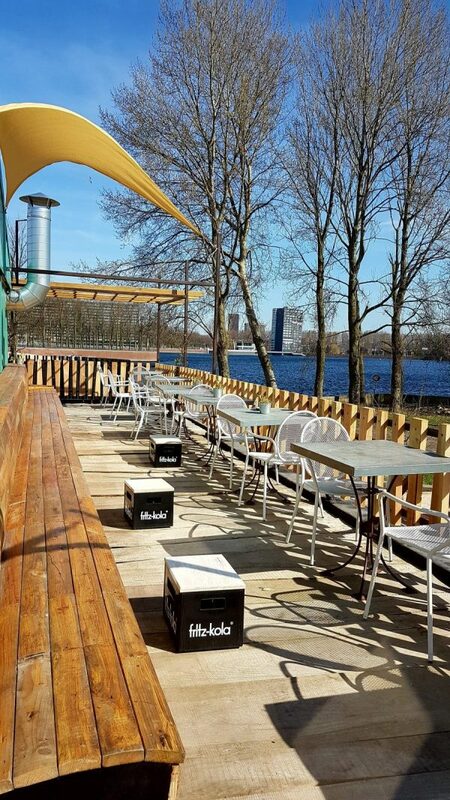 With the beach, newly build housing projects and Hotel Buiten, Amsterdam New West is certainly worth visiting this season! 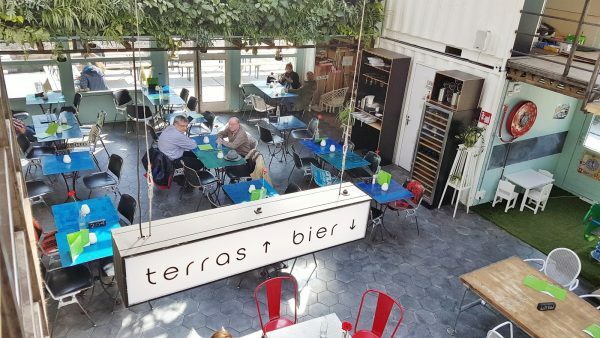 Find out where the best outside terraces in Amsterdam West are!